Nintendo will make several of their unreleased Wii U games playable at more than 100 Best Buy locations during the week of E3, according to Nintendo of America president Reggie Fils-Aime. Details are scarce, but it appears to mean that, instead of squeezing into the Los Angeles Convention Center during the week of June 10 to wait on lines to play the next big Wii U games five months before they're released, you can go to a Best Buy in the U.S. or Canada to do the same. This is a pretty cool announcement for regular gamers. For all of E3's history, gamers have had to depend on reporters and industry folks to tell them whether games shown at E3 were any good. E3 has never let the public in. In recent years, Sony, Microsoft, Nintendo, EA and Ubisoft have started to livestream their E3 press conferences, so that gamers could at least see E3's biggest, most exciting games when everyone at the show first did. Nintendo's Best Buy move lets you, the gamer, play the biggest games, at least from Nintendo—and as long as they're putting the A-list content there. Hopefully! Nintendo's Wii U E3 line-up is set to include the next big 3D Mario game, the next Mario Kart and the next Smash Bros.
No word yet on exactly which games will be at Best Buy, which Best Buy locations are participating and when the kiosks will show up that week. 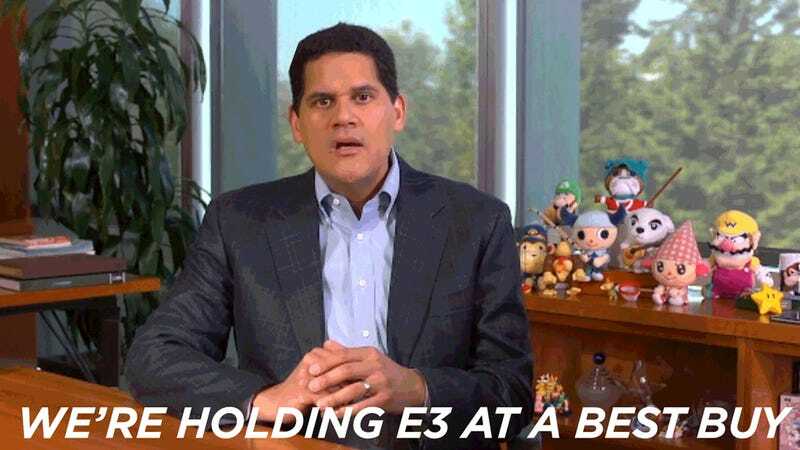 Nintendo will be announcing its line-up on June 11, so this Best Buy expansion of Nintendo's E3 booth will probably start then or shortly thereafter. Note: In the GIF up top, Fils-Aime is actually merely saying: "But we're excited..." We all know what he's getting at. E3 everywhere, people!